Article: What are the tangible benefits of soft skills? What are the tangible benefits of soft skills? Regardless of the seniority level, soft skills are critical to career success. Here are insights on the impact of soft skills based on an academic research that trained garmet factory workers. An academic research measures the tangible impact of soft skills on employee productivity, and their true return on investment to the business. For any individual, regardless of the seniority level, for example, Associate or CEO, it is very important to have a certain set of soft skills to be successful. Academic research by Cunningham and Villasenor in The World Bank Research Observer, says that “Surveys of employers from around the world corroborate that soft skills are in great demand; and that firms often struggle to find workers with high levels of these skills.” Soft skills are best inculcated from the childhood, as research has proven. A body of research also proves that it gets difficult to attain non-cognitive skills at later ages. For those with “low baseline stocks”, it is particularly difficult. This implies that people whose proficiency of these soft skills is on the lower side, it is hard to train them with such skills at an older age. An academic research tests whether workers with low baseline stocks can be taught soft skills, its business impact on the productivity metric and, if there is enough return on investment for companies investing in soft skill training. This article explores the findings of the study titled, ‘The skills to pay the bills: Returns to On-The-Job Soft Skills Training’ by Achyuta Adhvaryu, Namrata Kala and Anant Nyshadham. Productivity, for instance, is measured against the standardized metric across the global garment industry. Standard Allowable Minute or SAM (implies the minutes taken to complete one garment) is the metric of productivity. On an average, the impact of the treatment on retention was small and insignificant throughout the entire observation period of months. There was a big positive impact at the start of the program and it dissipated by the end, making the average impact very small. The treatment impact on cumulative person days (calculated from production data) is positive. “The treatment increases the cumulative person days per treated worker by 6.8 days during treatment and 16.2 days after treatment when the production data is used,” according to the research paper. “Surveys of employers from around the world corroborate that soft skills are in great demand; and that firms often struggle to find workers with high levels of these skills,"
Treated workers are assigned more complex tasks: Workers undergoing the PACE program are assigned more complex tasks both during and after the treatment. According to the research paper, the tasks they are assigned to take 7 percent more time (about 2.3 seconds) the control group. 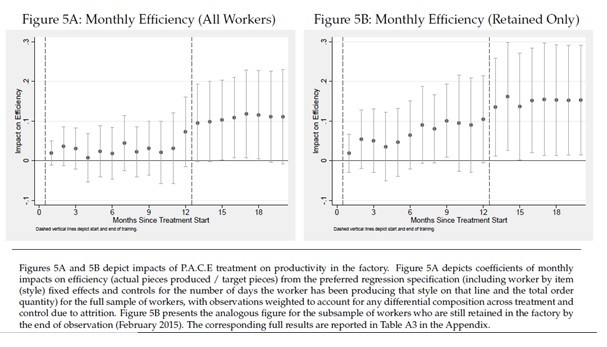 Treated workers get a negligible hike in their salary: The research also found out that the difference in salaries paid to people who took the P.A.C.E. program against others is a mere 0.5 percentage points. The gap in salary only appears later in the program and increases thereafter, albeit very gradually. If one looks at the two outcomes – increase in employee productivity and increased the ability to perform complex tasks – of soft skills in isolation, it is a great business case in itself. What is important to note here is, the employees being trained life skills under P.A.C.E. are doing more complex tasks than their counterparts and, are still being more efficient than them at the same time. “The non-cognitive skills like time management, goal-setting, and teamwork enhance worker productivity,” form the focus of the academic paper. The impact on a sustained increase in productivity is observed at the later stages in the program when there is a significant increase in worker productivity. This research proves that soft skills or life skills, indeed, can be taught at later stages of people’s lives. This is true, despite the fact that they have “low baseline stocks.” Being equipped with life skills increases the productivity of employees significantly (20 percent as the research proves), and they can perform complex tasks with much more efficiency. The research paper estimated the net rate of return to be 73 percent after 1 year and, 258 percent 20 months (~$340,000 return against ~$95,000 cost) after the program’s announcement. Soft skills equip people to do complex tasks: Even if people are oblivious to some of the life skills necessary to excel at work, they can be taught and equipped with them. These life skills enable people to do tasks which they would not be able to do earlier. 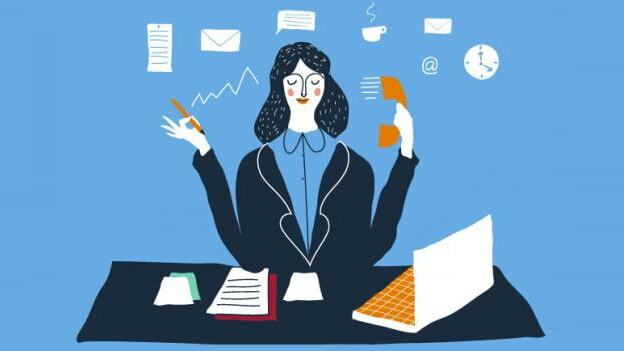 Soft skills equip people to be faster and more productive: People with a set of requisite life skills can perform tasks much faster and be more productive than without them. Skills such as communication, team work and ownership make them better at their everyday work. Investment in soft skills leads to true ROI: Investment in soft skills isn’t an incurred cost to organizations. It leads to exponential return. Despite these benefits, employees weren’t rewarded with a raise in salary. If businesses are to keep flourishing, not only do they need to train their employees with a combination of functional and soft skills, but also reward them for their performance. Or else, they stand at a risk of losing their best workers.